How does light cause UV damage to artwork? What’s so Important About a Dust Cover? Watch your back! Protect Your Framed Treasures from the Art Eaters! T raditionally, there are two ways of mounting and displaying military medals – court mounting and swing mounting. Swing mounting is pretty much outdated, but was a method of mounting medals on a uniform so that they swung and made a ‘clinking’ sound as the soldier marched. “Court mounting” originated in Germany as a way to keep medals from rattling in court, and was eventually adopted by the British and later the Canadian Forces, among most others. Although it may be optional as to how a soldier displays medals on their uniform (check first), court mounting is by far the more preferred method, and in most cases is mandatory when more than one medal is displayed. Since the medals aren’t clinking against each other with every step, the finish on the medals is better protected. However, as the medals are affixed to the backing, the backside of the medal is no longer visible (which isn’t an issue if you’re having them framed). There are VERY specific rules as to how medals are displayed, the ribbons used, etc. For instance, as medals are worn on the left, the medal with the highest precedence is positioned closest to the heart. At Jackson’s Gallery, about 15 minutes from CFB Edmonton, we specialize in court mounting medals brought to us for framing: refinishing and varnishing the medals (if you want, some don’t), replacing worn ribbons and mounting them in the correct manner. We can even frame them so they can be removed and worn for parades or events! Scroll Down and Leave a Comment! We Take Pride in What We Do! We still offer the same world class service (in fact with our new laser engraver we do MORE), but we’re also home when The Boys come home from school! Before You Do Anything, Get Your FREE Copy! 7 Things you NEED to know! BONUS: Jackson's Extraordinary Quick Ideas Framing Sheet! Even if you don't come in to see us at Jackson's Gallery and Engraving at least you'll fully understand picture framing and can avoid the pitfalls and make informed, intelligent decisions. Click here for more info, or hit the Download Now button below. And don't forget about the free gift on page 22! As a wife to a former marine, i’m so glad you know how to correctly display medals! it’s so important! Do you do embrodrie of CF military ribbons with a velcro backing? If so, how much for a 6 ribbon (2 levels) set? Thanks in advance. © Jackson's Gallery and The Runding Imagination Group 2019. Built under duress by The Spotty Internet Trolls ™ Powered by Divi and Divi Booster. 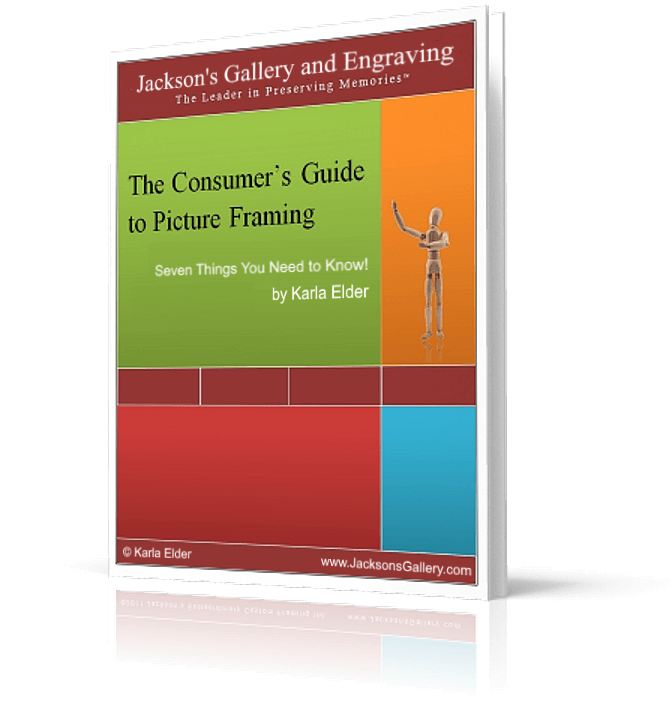 Get Your FREE Copy of "The Consumer's Guide to Picture Framing"!